Nikon Monocular - Potent Optics in a Tiny Package! The Nikon Monocular: Potent Optics in a Tiny Package! The Nikon Monocular doesn't seem to be particularly well known. We've been puzzled by that ever since very positive user comments prompted us to buy one for testing and review here. We even had to search online for an optics dealer that carried them. As we dug further into it, we discovered that Nikon monoculars are typically a special order item with Nikon and only a limited number of dealers go to the effort of stocking them. With that knowledge, we ordered ours and felt very good that it arrived in time for a trip to Seoul, South Korea. We also took along a Bushnell compact binocular, but we had different uses in mind for the binocular and monocular. We particularly appreciate the discreetness of small optics in situations where we might feel odd using something more noticeable. For us, it's whether we're traveling to another city&sol;community, state or province, or country, a monocular fills a number of our interests and needs. We love getting close-up views of wildlife wherever we are — that's an interest. We often find, when posing as tourists, that we're limited in how close a view we can get of a museum artifact, rare paintings at exhibits or murals in cathedrals — those, too, are interests served by a monocular. When it comes to determining where we are in a city (looking at distant street signs&sol;landmarks with map in hand) we consider it a need as essential as a pocket compass for saving time and steps in a new place. When we use it to check a shop's posted business hours from across the street or determining if what's ahead is worth walking to see when we're pushed for time and energy, we consider it a lifesaver. Will just any monocular do the job? After having carried a $30 or $50 monocular for a while several years ago, we can answer that the difference between that and this Nikon monocular is like night and day. At that time we didn't realize what a difference good quality optics could make in our enjoyment of a situation. But let's get back to our visit in Seoul, shall we? We wanted to go to a specific shopping district in Seoul that we had been to previously. We'd heard positive things about Itaewon and thought that might be the same one. We took the subway to the Itaewon stop and started walking down the street in the direction we thought was appropriate. After walking several blocks and seeing some interesting shops and sidewalk vendors, we began to have doubts about whether Itaewon was where we intended to go. Out came our trusty Nikon 5X15 High Grade monocular and we checked what was ahead of us and on side streets. It didn't take much looking to quickly conclude that we were in a part of town more geared to tourism than the shopping district the locals use. We found a knowledgeable person, described what we were looking for and received good directions. With that knowledge, we slipped down into the next available subway station and headed off Dongnimmun. When transferring between subway lines, our tiny monocular helped us to look ahead to see which direction we needed to go to arrive at the station platform we needed. Ultimately, we were rewarded with a much more interesting shopping experience. Yes, we were ready to rest by the time we went to sleep that night, but we'd covered much more ground and done it more efficiently than we could have otherwise, thanks to our Nikon monocular. The Korean culture is old and distinguished and Seoul has many cultural centers and museums. Let us simply say that, with a close focus distance of just 24in (0.6m), our little Nikon monocular is very, very nice for seeing the rich details of beautiful artifacts on display enclosed in glass display cases or beyond rope barriers. The Korean Palace is a historic (restored, as we recall) structure which you cannot enter, but you can look through the open windows at what palace life used to be like. On the roof are small figures that you'll be hard pressed to see clearly without optical assistance. No matter where we go, we find we learn more and enjoy it more with good optics! When we're traveling and are extraordinarily limited on space and weight — one of the very last things we'll give up is a monocular like our Nikon High Grade (HG)! We know folks who use their Nikon HG monoculars for bird watching on the sly when a compact binocular would be inconvenient. Police carry them for watching suspects' homes or drug houses and other activities they encounter. Yet others carry them more often than binoculars because of the excellent opportunities for checking out wildlife they encounter unexpectedly during a day. The possibilities are endless. Let's actually review the monocular and stop talking about the uses for it! Let's start with a description of this instrument's construction. What Material is Used for the Monocular's Body? We've been privy to discussions where a number of otherwise well-informed people have asserted that the housing for our new Nikon monocular is made of titanium. We thought about that. The housing certainly feels wonderfully sturdy, as though it might well be made of titanium, but it seemed a little heavier than we thought it would if it were made of titanium. When we added in the fact that articles made from titanium are not cheap, we felt that the price for the Nikon monocular was appropriate for its very good optics, but that price was too cheap to include a titanium housing! We contacted a friend with Nikon who made inquiries and came back with the information that the housing is stainless steel. 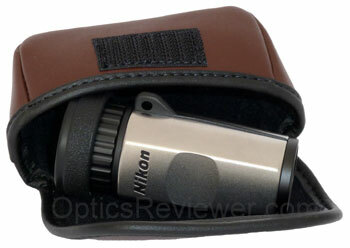 It's similar, in that respect, to beautiful binoculars Nikon has made with stainless steel housings/frames in the past. The metal gives it a pleasant heft that helps to steady it in the hand and certainly gives the perception of indestructibleness. The instruction manual that comes with the Nikon 5X15 High Grade monocular says that the user should avoid rain, water splashes, sand and mud. We understand that to mean that it's not waterproof. On the other hand, a monocular this small (only 2.7oz&sol;75g and length and width are 2.8x1.2in&sol;71x30mm) is easily kept dry in a plastic bag with zipper-like closure and we've had no problems carrying it in a variety of weather situations. Having said those things, we're aware of Nikon monocular owners who use their instruments in very humid locations and damp weather and say nothing but good things about their weather resistance. We'll still take our plastic bag instead of taking chances with these great little optics! The eye relief on the monocular we bought was specified at 15.8mm and it seemed as though that was accurate. This should be plenty of eye relief for most eyeglass wearers. It's only 12mm on the 7X15 configuration, which may be a bit scant for eyeglass wearers. The eyecup surface is a comfortable rubber-like material that, while not soft, is not hard or slippery to the touch. The eyecup was not what we typically think of as an eyecup today, but is more reminiscent of the eyecups of the 1950s and '60s — more flat than anything else. We didn't feel as though this presented a hardship, however, since it seems as though we naturally hold this size of monocular with the sides of our fingers&sol;thumb against our face for steadiness. We tried cleaning the spots with a new LensPen (Amazon.com or Amazon.co.uk ) and found it cleaned most of the spots off with a little effort, but not a stubborn one. We switched to one of Carson's dry nano-particle cleaning formula lens cleaners we'd been using on other lenses and it seemed to clean that stubborn spot easily and quickly. We don't know what all is different about the Carson lens cleaners, but we like them! This monocular is no different from most others. It has a focus ring at the ocular that turns to focus it. This monocular is a roof prism design and its focusing system is internal to the monocular. Similar to a Porro prism design, however, you'll see the ocular lens move back and forth as the focus is adjusted for distance. If we didn't adjust the focus for a while, we found that the focus ring would need a little bit of extra power to get it to move at first, but after that it adjusted very smoothly and easily. This made us wonder if the optics were waterproofed. As noted elsewhere, however, Nikon says that rain and water splashes should be avoided. 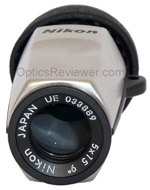 Our Nikon High Grade monocular had "Japan" written on the ring around the objective lens. You can see it in the accompanying picture. We understand that to mean the Nikon monoculars are made in Japan. While the Nikon monocular is attractive to look at, it is particularly attractive to look through. The designers have done well with its optics. Although there is a Nikon 7X15 High Grade monocular available, we selected the 5X15 configuration for a couple of reasons. A significant one is the 9.0° angular (real) field of view available with the 5X15 configuration as compared to the 7X15's 6.6° field of view. The difference is 471ft at 1,000yds (144m at 1,000m) for the 5X as compared to 346ft at 1,000yds (105m at 1,000m) for the 7X — or only about 75&percnt; of the 5X15's field of view. For our purposes, a wide field of view is worth more than the 2X increase in magnifying power. The second reason is the eye relief and we've already talked about that above. We were interested to notice that High Grade Nikon monoculars provide a greater depth of view than many roof prism optics. It's easy to swing our view to something at a different distance without having to make a major focus adjustment. It's not the quite the same as a Porro prism would provide, but better than many roof prisms in our opinion. How Much of the High Grade Monocular's Field of View is Usable? We were impressed with the flatness of the field of view with the Nikon monocular we tested. There aren't many optics with fields of view that don't demonstrate significant effects from the curvature of the lens system. That is to say, the curvature of the lenses causes the view to go out of focus the further you go from the center of the view. We did find some loss of focus, but it wasn't as much as we would normally expect. In the unit we bought and tested for this review, we found that the sharpness of detail started to soften very slightly at about 66&percnt; of the field of view radius when measuring from the center. At about 92&percnt; of the radius, our test unit's image began to get noticeably fuzzy on details. Part of the excellent resolution of details is because the roof prism is phase correction coated — this is always a benefit, but is not always part of manufacturing monoculars of lesser quality. We were particularly interested to see how the Nikon monocular did with resolving details with its multi-coated optics. We use an optical device called a "doubler" to increase the magnification power when we're testing resolution. This is helpful to us because it will magnify a binocular's optical capabilities as well as any problems in a lens system. When we included the doubler in the Nikon monocular's optical system, we found that the little Nikon monocular was resolving details significantly above what we could discern when simply using the monocular. Not all optics do this and it speaks very well of this monocular's optics! It's worth noting at this point that Nikon has made the High Grade monocular's optics with a silver alloy reflective coating for the roof prism used. It's superior to the cheaper, aluminium coatings which don't transmit as good a view as the silver does. Not only does it transmit light well, but the quality of the image and the resolution of details in that image are superior. We felt the quality of the view was well worth the silver alloy coatings! The exit pupil for our little monocular is specified to be 3mm. It's not a lot, but quite adequate for the majority of circumstances with a monocular this size. We didn't experience difficulties in getting it aligned to be able to see, which is what we usually think of when working with a smaller exit pupil. The 7X15 monocular's exit pupil is only 2.1mm per Nikon. It may be usable, but that's getting quite small! We were impressed with our monocular's rendering of colors. Although chromatic aberration is not a significant concern with the HG monocular, we found that the lower magnification helps in seeing very little blur between colors. Yes, there is a small amount of chromatic aberration, but it wasn't evident to us in general use and we had to work to find it with our test unit. We didn't test our monocular in low light conditions the same way that we test binoculars under those conditions since most of us won't use a 5X15 monocular as we would binoculars. Having said that, we do expect that monoculars will be called into duty for evening or nighttime viewing by street lighting or in a theatrical performance, concert, etc. We tested our monocular's performance in those types of settings and found it to be a very solid performer. 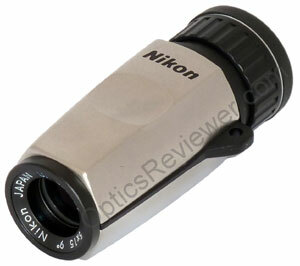 We've seen some online retailers who stock the Nikon 5X15 monocular say that it has a close focus of 18in. The instruction manual that came with ours indicated that it has a close focus of approximately 0.6m and we calculate that to be just a fraction under 24in. When we checked ours, we found it had a close focus distance of 21.5in (0.55m). The specification for the Nikon 7X15 High Grade monocular is approximately 0.8m, which calculates to 31.5in. We were very happy to find that Nikon engineers had designed the focus to move from close focus to infinity in just a single, clockwise revolution of the focusing ring! It's the optimal design, in our opinion, for a very user-friendly focusing mechanism. Something this size doesn't come in a very big box! We received the Nikon 5X15 High Grade monocular with an ocular cap, a discreetly lightweight black lanyard, and a carrying case with Velcro closure. The case itself is made of a vinyl-feeling material with a soft black lining. If the case is as durable as the vinyl car seats we've had, it should be a good one. The ocular cap seems to stay nicely in place by friction. We also found the instruction manual and warranty card included in the box with our monocular. We really love our little Nikon monocular! It's a "go anywhere" optic that is easy to slip into a shirt or coat pocket, purse, backpack, carry-on bag (we try to always hang optics around our necks to reduce vibration while flying)…we're stuck trying to imagine when we wouldn't find it helpful. This tiny monocular will delight the most discriminating user looking for something capable of being discreetly slipped into a pocket or handbag. We know the broad-ranging applications we put it to use for, but we're confident that we're only touching the very tip of uses for a miniature, high-quality optic such as this. Please, send us a note via our contact page to tell us what you use your monocular for! We make the majority of our online purchases from Amazon since we've found they nearly always have the lowest prices. Use these links to go directly to Amazon's listings for each configuration without having to search for them. Here's the link for the 5x15 Monocular and this is the one for the 7x15 Monocular . Nikon's 25 Year Limited Plus No-fault Warranties are excellent. They cover a Nikon monocular during the time that you would reasonably expect an excellent optical instrument to be functioning smoothly. If your Nikon monocular requires a service or repair not covered under the limited warranty, you'll want to include $10 with your monocular and you'll be responsible for return shipping and handling. It's covered even if the problem was something you caused.